Thousands more students will receive counselling and emotional supports with new programs to reach youth in schools across the province. Minister Hoffman is joined by MLA Carson, staff and students at Jasper Place High School and the Chair of the Edmonton Public School Board to announce funding for additional mental health programs in Alberta's schools. A new $5-million provincial grant will be used to hire staff and build new school-based community mental health programs. More than 100,000 students at schools across Alberta will receive these school-based mental health resources. 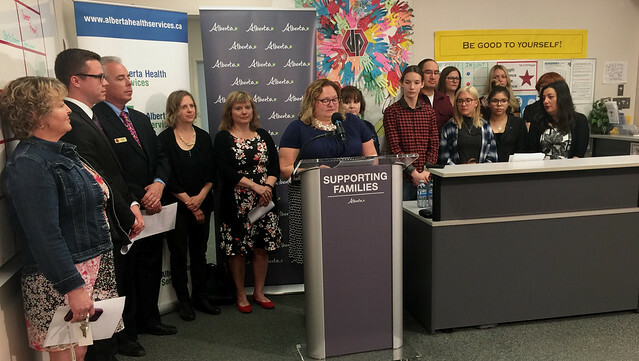 New mental health staff will be hired to work with schools to deliver supports for children and youth struggling with a range of conditions, including anxiety, depression, self-esteem and relationships. They will also act as crucial links to additional mental health resources in the health-care system. Increasing mental health supports for children and families was identified as a priority in the Valuing Mental Health review. The application process for schools wishing to develop or expand mental health programming will get underway this summer. The Mental Health Capacity Building in Schools Initiative uses schools as community hubs to deliver mental health services and programs and to provide information and early intervention and treatment services. The program helps reduce stigma and increase child and youth resiliency so they are better able to manage stress and any challenges they may experience that could increase their risk for future substance use and mental health issues. The initiative currently supports 37 school-based mental health programs, used by approximately 65,000 K-12 students. The additional investment allows for the development of up to 15 new programs, expanding the reach to more than 100,000 students across the province.